Through my professional practice I am continually seeking to get an accurate gauge on the current level of practices and participation at ‘typical’ special schools, compared to that of home schooled individuals and mainstream school pupils, while analysing what influences and informs their methods of participation. To do this accurately, we must first contemplate the historic overview of PMLD engagement within the creative arts (of which there is very little research evidence); observing any changes in participation over time due to continual advancements in assistive technology. 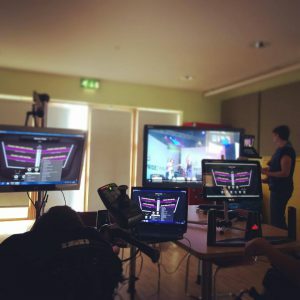 We must also consider how the existing theories on inclusive arts participation are able to actually account for the involvement of people who experience PMLD, focusing on whether or not the process of integrating assistive technology has impacted on their behaviours. Only then can we understand how the broader notion of inclusive arts fits within the current theories around participation of people who experience PMLD. My motivations for these questions are: to review previous developments in research on inclusive arts practices and creative arts therapy for people experiencing PMLD, to find out the reasons for the changes in the research trends of the past decade, and to see possible research directions in the future. “‘more than one disability, to which one of these is a profound intellectual impairment’ and a multiplicity of disabilities include sensory or physical impairment’ and other factors such as autism, behaviour that challenges, self-injury and mental health issues’” (Lacey 1998, pg ix). Consequently, young people experiencing PMLD are repeatedly denied the creative experiences of their peers because often their environments are unresponsive and unsupportive, and as Malone (2016) states, their “disabilities make it impossible for them to take part in usual childhood activities. They can remain locked in a silent, static world, isolated and under stimulated,” and their lived experiences remain largely undocumented. http://www.soundabout.org.uk/babysoundabout-0-4/4553524972. ‘Inclusive arts’ is somewhat contrary term as it presupposes exclusion and has, at times, been associated with “oppressive inclusion agendas” (Fox & Macpherson, 2015) – which in many cases have proved nothing more than a futile tick box exercise for educators. Conversely, through my current role as a creative arts practitioner, and my previous role as a drama teacher I have seen continuous evidence of the integral role that inclusive arts play; not only within the arts themselves, but within specialist education and within the field of expressive therapy. The practices involved in creating inclusive art have the potential to promote an idealist version of how a truly inclusive society should be. However, White (2009) & Hall (2013) acknowledge a gap of research evidence in this area, stating that the momentary “psychological empowerment that arts projects can achieve does not necessarily relate directly to broader forms of social inclusion or empowerment”. A great deal has been researched in relation to inclusive arts and creative arts therapy methodologies; sometimes the terms are used interchangeably. Indeed, the inclusive arts have consistently proven to have many therapeutic benefits – instigating social interactions, alternative forms of communication and creative expression. However, unlike inclusive arts, creative arts therapy primarily focuses on empowering the participant through the creative process for the physical and emotional benefits (Sumsion 2000, p. 308). A greater understanding of practices with people experiencing PMLD would assist in the development of truly inclusive models of delivery in the future. Historically, many teachers have displayed negative attitudes towards pupils experiencing PMLD and this has impacted negatively on inclusive practices. 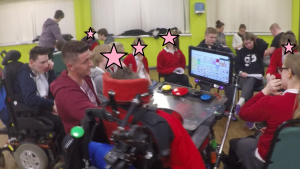 Thankfully times have changed and there is now widespread inclusion of pupils experiencing PMLD who are now being integrated into mixed‐ability classes, but evidence suggests that this is not enough. Numerous qualitative studies have explored how creative arts therapists work with people who experience PMLD. Their therapeutic approaches have differed vastly, raising critical questions about how work with people experiencing PMLD is perceived; from both a clinical setting and from an inclusive arts perspective. So what role does assistive technology play in the creative arts? 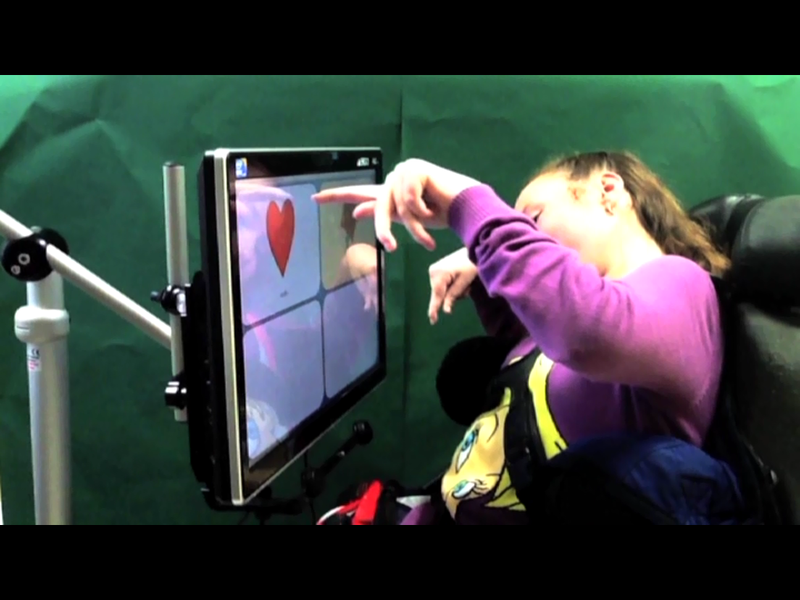 It can provide opportunities to utilise switch and eye gaze control which can then be applied in other functional activities devices enabling people experiencing PMLD to have greater independence and freedom within their creative expression (Kirk et al., 1994). Indeed, in my experience I have found that for some people experiencing PMLD, technology can be the key to unearthing a new pathway for communication, mobility and learning which historically has not been available. Building on the research of Bob Hughes (2004), I seek to determine whether or not re-introducing the developmental stages/early skills that have been missed by people experiencing PMLD in early years (when assistive technology was not readily available) can increase active independence, while simultaneously inspiring artistic expression, and an enriching encounter. 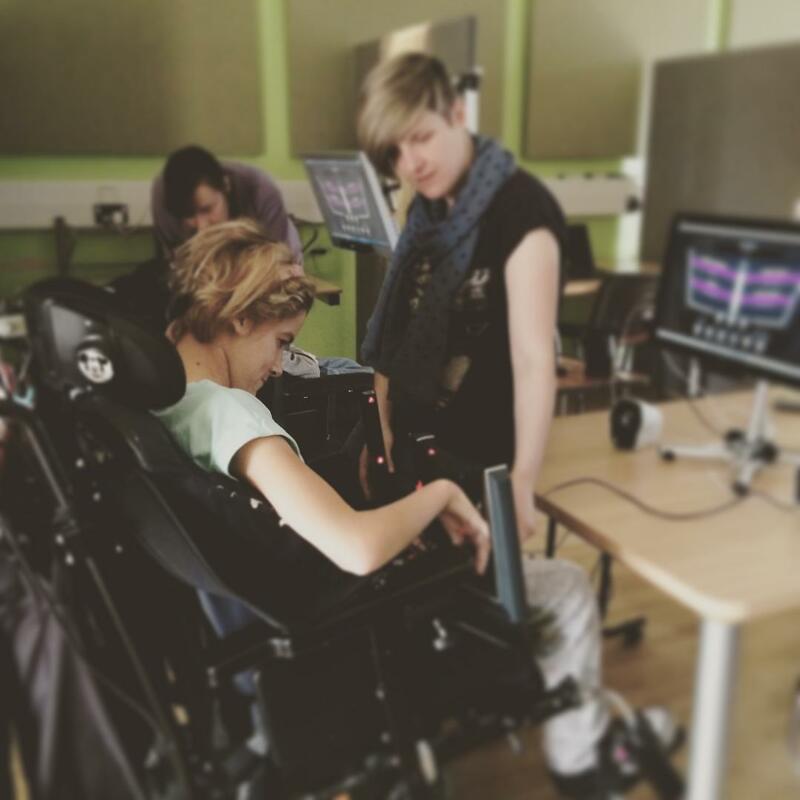 I have also been assessing the effectiveness of utilising assistive technology as a tool for stimulating creativity and further developing their communication skills in a variety of educational and non-education environments; applying and developing the existing skills of people experiencing PMLD (life skills, sensory, communication, physical, cognitive, social, and emotional). I am in the process of designing a robust model of delivery for creative arts practice that is both therapeutic and truly inclusive for people experiencing PMLD. I am developing this, utilising the arts to introduce concepts of AAC and other assistive technologies, enabling people experiencing PMLD to explore life and creativity independently. “If you present yourself as a therapist, that’s what you’ll always be. There are clearly beneficial and therapeutic aspects to our work, but that’s not why we do it. It’s always about the art”. (Mark Williams, in Groves 2012). Indeed, my own collaborations with people experiencing PMLD have required me to consider new ways of facilitating non-verbal communication, and to embrace new technologies through which to augment longer-lasting creative expression, but I assert that through inclusive art and creative therapeutic practices, both the process and the end product can collide at an intersection to create high quality art and an enriching experience. This begs the question as to what ‘inclusion’ actually is, as there is still a lack of clarity regarding its transformation from theory to practice (Sikes et al, 2007). Is its core objective to integrate people experiencing learning disabilities into mainstream practices? Or is the ethos of inclusion about making learning and participation accessible to everyone? (I personally believe it is the latter.) There are so many contradictory interpretations of inclusion that it is affecting how inclusion is actually performed. Professor John McLeod (2004) raises a fundamental question regarding the true nature of inclusive arts: “Who is included and who is excluded? And why does this matter?” Stinson (1995) states that, “Using arts processes to teach academic subjects results not only in improved understanding of content but it greatly improved self‐regulatory behaviour” (p.87). Indeed, research has proven that the creative arts can instil discipline, whilst allowing for the exploration of emotion. Furthermore, the repetition of expression can develop gross motor skills through activities such as dance and movement. I assert that it is possible to forge a truly inclusive arts practice that is both therapeutic and delivers quality pieces of self-expression for people experiencing PMLD. What therapeutic benefits do the approaches provide, and to what end do factors such as assistive technology affect its use? I have been researching this somewhat unexplored area of examination using an exploratory case study methodology. Although it has been suggested that the most likely educational placement for pupils experiencing PMLD is in a special school, I have not been restricted to this area alone. Consequently, data collection has been conducted in one special school, at the home of two home-schooled pupil and at one mainstream school. I will be reporting my findings via this blog over the next 6 months. Observations of several sessions undertaken over the period of a year where teachers were using creative arts therapy, inclusive arts practice and assistive technology as part of a typical school day. Traditionally, participatory methods of research have been more beneficial to those who can communicate verbally. People experiencing PMLD who cannot talk, have generally been overlooked, decreasing the population of those who are suitable for investigation. For this research, the definition of participation has been re-negotiated through interpersonal methods that are continuously being adapted to meet the diverse participation styles of those experiencing PMLD. To that end, theoretical perspectives about ‘voice’ as explored in the Mosaic Approach (Clark, 2003) have been adopted – deprioritising verbal communication through Participatory Appraisal techniques. This research also aims to represent individual experiences to get a general insight of each participants’ perspective. People experiencing PMLD explore the world in complex ways and I draw from phenomenological concepts of embodied self-awareness (‘being’ through our embodiment) to investigate how this gives us a means to access the world as is understood through the body to people who experience PMLD. This thesis will work towards a user-centred methodology to research interpersonal communication of people experiencing PMLD.